The Medicine guide discusses Cambridge Interview Questions in depth with answers and approaches – along with possible points of discussion to further demonstrate your knowledge. 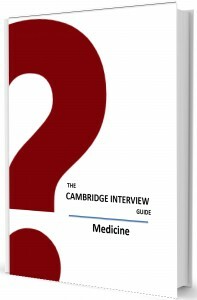 The Medicine Guide also includes the Cambridge General Interview Guide. It has been specially edited for applicants for each subject by a team of Oxford and Cambridge graduates. The Cambridge Medicine Interview Guide is available to download now!